I was actually expecting "Walls" to have made an appearance by now, given the music video came out a couple of days ago. Looks like any surprises that may occur are going to happen in the encore, but here's hoping for a shake-up in the main set too. It was pretty slim pickings for videos at the time of writing this post, especially on YouTube, but there were some on other platforms. 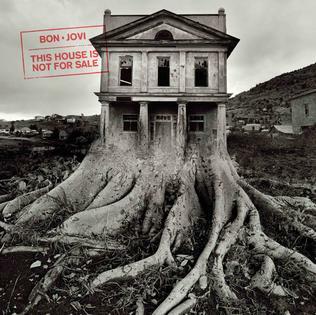 Bon Jovi's music video for "Walls" -- the second new track on the re-release of This House Is Not For Sale -- has dropped exclusively on Tidal. When Jon was on Facebook Live last year, he alluded to one of the new songs being shaped by the current political climate, and the "Walls" video reflects that. John Shanks and Everett Bradley, who were both in the video for "When We Were Us", are in this one as well. They've also appeared on tour merchandise but as far as I'm aware they're not considered "official" band members. On the other hand, Hugh McDonald was left out of a lot of videos and promotional materials until he was made official in 2016. So that's... interesting. If you're not a subscriber, you'll just get a preview, but when the whole video makes its way to YouTube in a couple of weeks' time, I'll add the link to this post. Well, we didn't get "I Love This Town". 😁 Aside from that the set list looks quite familiar. Bon Jovi took their This House Is Not For Sale Tour to Salt Lake City, where Hugh McDonald's stepson Jake was the opening act, performing with his band Jake J and the Killjoys. Bon Jovi's set list was... exactly the same as that of the previous show in Denver. One key difference was John Shanks messing up the beginning of "We Weren't Born to Follow", which resulted in Jon restarting the first verse and chorus as an acoustic piece. (There's a video of it below.) Said acoustic version turned out to be way better than the original IMO, and I kind of wish he'd done the whole song like that. This show happened to take place on Everett Bradley's birthday, which the band acknowledged when he got on the plane. ok. listen up. regarding @Wikipedia , my middle name has NEVER EVER been Eric. i’ve had friends correct it. heck, my own brother even changed it last month but low & behold, it was Eric this morning. my full name is Phil Theofilos Xenidis. Theofilos. it means “friend of God”. “Jon was good enough at Christmastime to surprise me by sending me a framed copy of the email that he sent to the Rock and Roll Hall of Fame, telling them my history in the band over the years and that I deserved to be in with them. I can’t even explain how much it means to me,” McDonald said with audible emotion. The story of how Hugh winged it as Poison bassist for a night is also discussed. Read the full article at this link. This is kind of a "catch up on things I didn't have time to post about before" post before the resumption of the This House Is Not For Sale Tour. First of all, Jon Bon Jovi did a solo Runaway Tours show at the Hard Rock Hotel in Las Vegas on February 26, 2018. I know that was over a fortnight ago, but hey, I was busy. I don't always post about the Runaway Tours gigs but this one was worth mentioning because it included the live debuts of This House Is Not For Sale bonus tracks "I Will Drive You Home" and "Color Me In". Anyway, the Bon Jovi tour kicks off again tonight in Denver. Bon Jovi was honoured with the inaugural Icon Award at the 2018 iHeartRadio Music Awards. They also performed "It's My Life" and "You Give Love a Bad Name". I was at work when the award ceremony was taking place so I had to catch up later. After reading people's comments about how awful Jon sounded, this actually wasn't as bad as I was expecting. Not that it was particularly great, either. I don't know if he's done permanent damage somewhere along the line, but he appears to have a vocal coach again so I'm hoping he can get back to sounding consistently good.